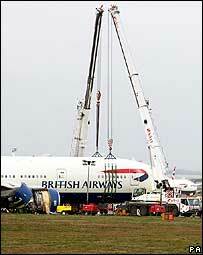 The British Airways plane that crash-landed at Heathrow has been moved from the southern runway. Engineers described it as a "delicate" operation to place the 200-tonne jet on wheeled platforms to be taken to a hangar 500m away. Accident investigators will continue with their examination of the plane and are expected to report back in 30 days. All 136 passengers and 16 crew on the BA flight from Beijing survived after the crash-landing on Thursday. 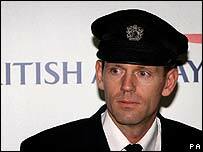 Speaking before the completion of the operation, Bruce Hunter, general manager of BA Operational Maintenance, had said it would take hours to complete the removal of the jet in "very, very delicate operation". He said: "The guys have to make sure that everything on the aircraft is safe and secure. We're working in conjunction with the Air Accident Investigation Branch to make sure we don't disturb the investigation site. The operation was a "very delicate and very tricky" one, he said. An initial report into the crash-landing by the AAIB found the jet's engines failed to respond to demands for increased thrust from the crew two miles from touchdown. One person suffered a broken leg and others received minor injuries during the emergency evacuation of flight BA038. Co-pilot Senior First Officer John Coward, who brought the plane in, has said how he feared everyone on board was going to die. Mr Coward, 41, told the Sunday Mirror how he became aware of a loss of power on board the plane on the final approach to the airport. "Suddenly there was nothing from any of the engines, and the plane started to glide," he said. "I didn't think we'd clear the fence at first. As we landed I was bracing myself for an enormous thud. But instead of one thud, there was a series of thuds as it bounced along the grass." As part of the recovery operation, hydraulic jacks and air bags were used to position eight canvas straps under the hull of the aircraft. These were attached to two specialist cranes, each capable of lifting 150 tonnes. Engineers then jacked up the aircraft inch by inch high enough for the electronically controlled wheeled platforms to be placed underneath before moving the plane. The Air Accident Investigation Branch is now investigating "the range of aircraft systems that could influence engine operation", and a more detailed analysis of the flight recorder is also taking place. What went wrong with BA flight? Will third runway add to risk?